Join El Salvador’s Asociación Ciudadana’s (Group for the Decriminalization of Therapeutic Abortion) campaign ‘We are all the 17‘. They are women who come for poor economic backgrounds. Most had obstetric problems during their pregnancies and gave birth without medical assistance. They were bleeding when got to hospital asking for help, and once there, they were reported and prosecuted for aggravated murder. In the video of the campaign, each woman’s life is represented as a flower, and the request is to not let their lives wither. Ask the members of the Salvadoran government and the Legislative Assembly to grant the requests for pardons for these 17 women, imprisoned without evidence of wrongdoing. Sign the petition ‘We are all the 17′ from RH Reality Check, the International Campaign for Women’s Right to Safe Abortion, the Salvadoran Citizen Group for the Decriminalization of Abortion and 6,847 other signers to tell the government of El Salvador to grant pardons for 17 Salvadoran women imprisoned for pregnancy complications. You can also participate in the photo campaign by sending your picture holding a flower to rose@cawn.org. Spain: Campaign to stop the reform of abortion law, which restricts access to safe and legal abortion, putting women’s life and health under threat and neglecting their right to choose not to continue a pregnancy. 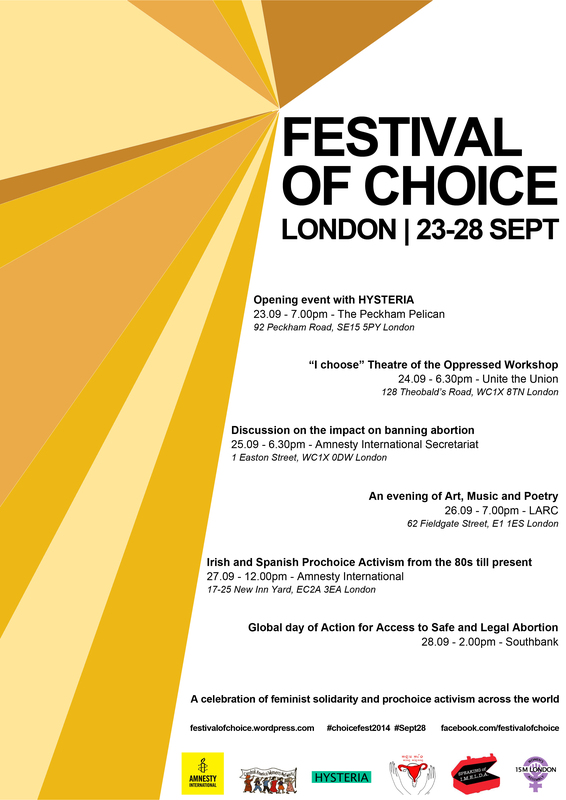 The Festival of Choice raises awareness of threats to reproductive rights and of the plight of women and girls in countries around the world who do not have access to safe and legal abortion. In solidarity with the 28th September- a global day of action to decriminalise abortion around the world, The Festival of Choice calls on all governments to remove any criminal penalties against a woman or girl for undergoing an abortion or for anyone assisting her to access or undergo the abortion; so long as it is based on the woman or girls’ consent. 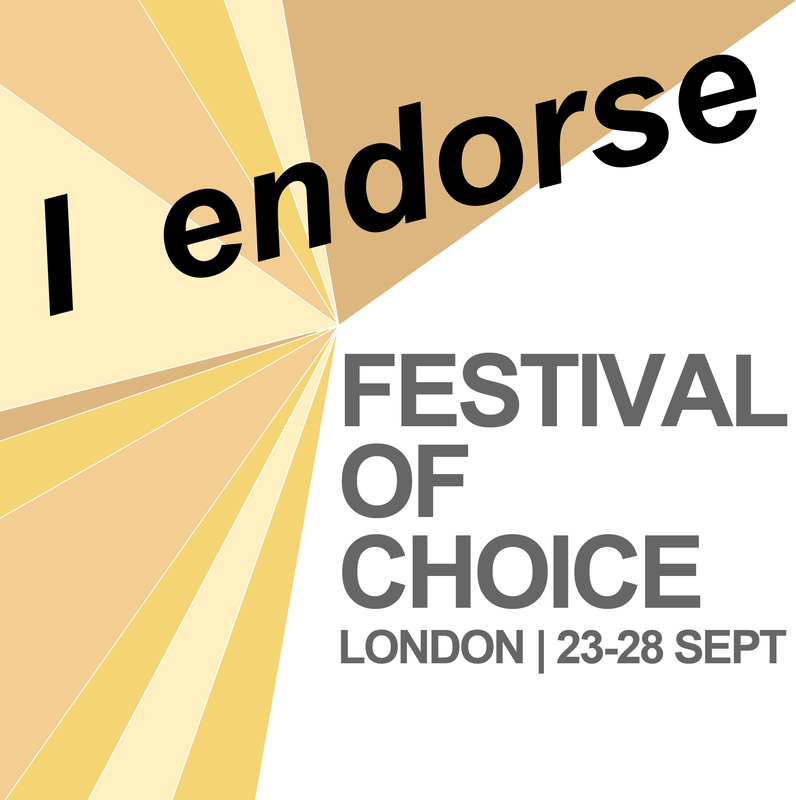 The Festival of Choice encourages people to raise their voice and take action to protect the right of women and girls to decide in countries where this is respected, and to fight for the right to safe and legal abortion in countries where this is yet not the case.